September 14, 2016, 1:29 p.m. The latest Economist/YouGov Poll was conducted both before and after Hillary Clinton left the campaign trail because of a pneumonia diagnosis. But there is no indication that opinions were greatly changed. Polling began on Saturday and continued through Tuesday. Last week’s two-point Clinton lead remained unchanged: she leads Republican Donald Trump 42% to 40% in the four-way contest, and 46% to 44% in the two-way race. Last week, the poll suggested that voters were becoming less certain of their preference. They are somewhat more certain today, but that hasn’t altered this poll’s image of the race. 83% of registered voters claim they have a good idea of how they will vote, and those voters support Clinton, but just barely: 47% say they will vote for her, 45% for Trump. If anything, the already long campaign may have made voters a little more wary of both candidates. Last week’s “Commander-in-Chief” forum put national security on the minds of voters, and one in four say security or terrorism is the most important issue in their vote for President this year, ahead of a number of domestic issues. Two-thirds of those voters support Donald Trump. However, Trump continues to lag behind Clinton among all voters on several questions about preparedness to lead the country when it comes to international affairs. However, on several of these questions neither candidate fares well. 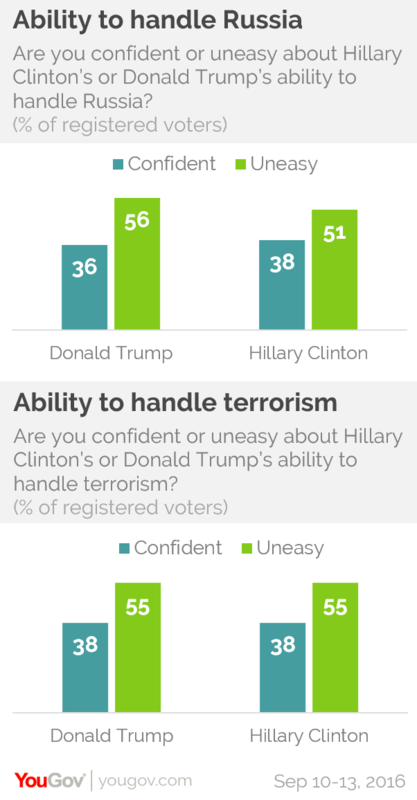 Majorities of registered voters are uneasy about each candidate’s ability to handle Russia, and Clinton and Trump do equally poorly on voters’ perception of their ability to deal with terrorism. 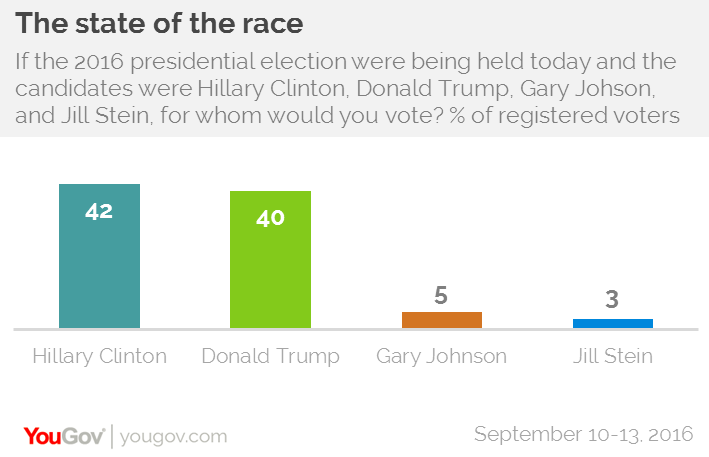 Trump runs well with military veterans, leading Clinton by eleven points with that group. And military families give Trump higher grades when it comes to caring about their needs and problems (38% say Trump cares a lot, while 30% say that about Clinton). But Clinton retains some advantages. 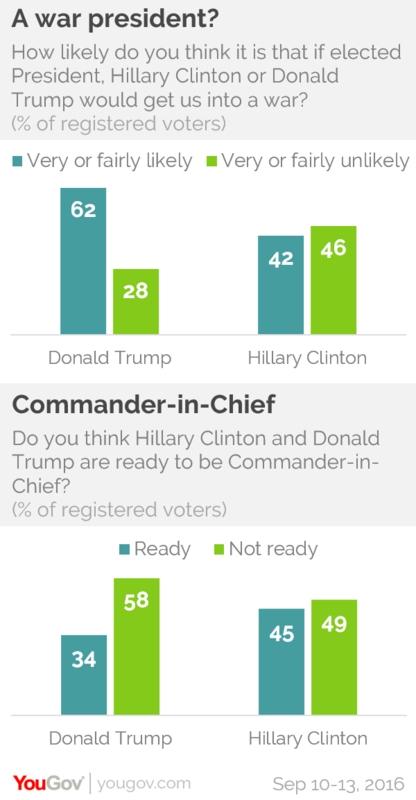 First, when it comes to doing the job of Commander-in-Chief, only one in three registered voters think Trump is ready to do the job. Opinion of Clinton is mixed, but she scores eleven points higher than Trump on this measure. And there is a clear perception that Trump could get the United States into a war. More than six in ten registered voters think that a war under a Trump Presidency is likely – 20 points more than say that about Clinton. Three in ten of Trump’s own voters expect there is likely to be war in his presidency. These foreign policy differences may in part explain Clinton’s continuing edge, as narrow as it is. 51% of registered voters say she has the qualifications to be president, something just 36% say about Trump. 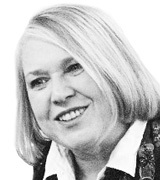 And – should those now supporting Libertarian Gary Johnson and Green Party candidate Jill Stein or someone else change their minds – this could help Clinton. While these voters have serious doubts about both major party nominees, nearly four times as many believe Clinton is qualified as think Trump is. Clinton also did better than Trump in last week’s Commander-in-Chief forum, at least among those voters who watched the forum in its entirety. 51% of those registered voters said Clinton did the better job; 44% said Trump did. But nearly two-thirds of this group also approved of moderator Matt Lauer’s performance, a stark contrast from the negative reviews Lauer received from his colleagues, other journalists. Not that voters give other journalists credit for their work this year: 61% of registered voters believe the news media is doing a worse than usual job covering this election. Voters do want a more active moderator than Lauer for the upcoming presidential debates – the first one of which will air in less than two weeks. 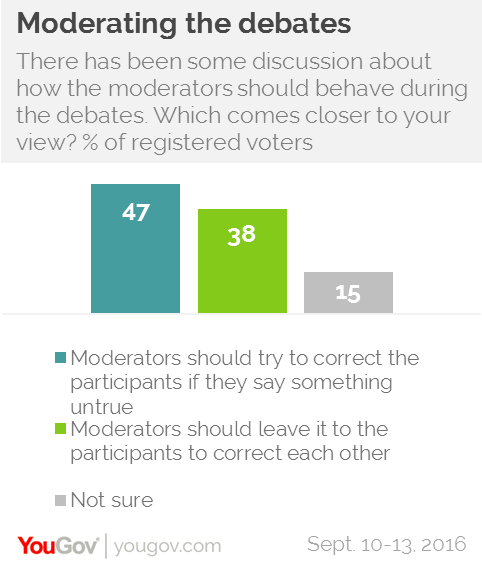 Voters are more likely to say a moderator should correct the participants if they say something untrue than to think that correcting statements is something that should be left to the candidates themselves. But the debates are a forum where Hillary Clinton is expected to shine. By eleven points, all registered voters think Clinton will do better than Trump than believe the opposite. Her supporters are more sure of their candidate’s superiority at debates than Trump voters are of their candidate. 85% of Clinton voters think she will do better; 73% of Trump supporters think he will. And those not yet committed to either major party candidate favor Clinton in the debates, 41% to 17%.